Today, Perfect World Entertainment Inc., a leading publisher of free-to-play MMORPGs, and Cryptic Studios announced Mirror of Discovery, is now available for Star Trek Online on PC and releases on Xbox One and PlayStation®4 at a later date. The newest update to the free-to-play Star Trek MMORPG continues a pivotal story introduced in the first season of the CBS television series, Star Trek: Discovery. For the first time ever, Star Trek fans will finally meet the Terran Empire’s dreaded Captain Killy, voiced by Mary Wiseman from the show. As leader of the I.S.S. Discovery, Killy’s ruthless reputation was often mentioned in the series, though her character was never shown on-screen. Players unravel the mystery of what really happened to her and the crew of the I.S.S. Discovery, after it was summoned to the Prime Universe and never seen again. 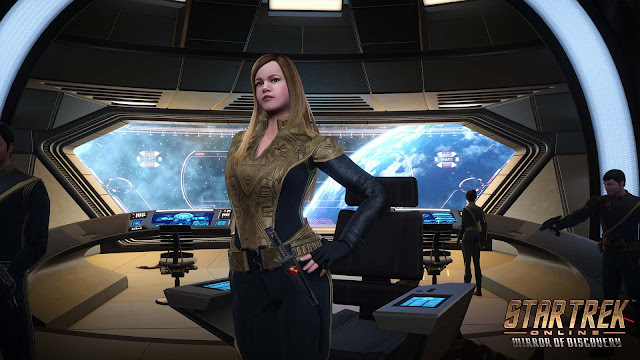 In addition, Captains explore all-new missions, an update to the Endeavors System and special challenges to celebrate Star Trek Online’s 9th anniversary. Last fall, Star Trek Online took its maiden journey into the Star Trek: Discovery universe with the launch of the continuing saga, Age of Discovery. Mirror of Discovery picks up where the first installment left off, just after players battled the Klingons with the support of fellow Starfleet Academy-mate, Sylvia Tilly (also voiced by Mary Wiseman). Discovery fans may remember an episode from the first season, where the U.S.S. Discoveryand its crew were abruptly transported to the Mirror Universe. At the same time, the starship’s counterpart, the I.S.S. Discovery, was said to be destroyed by the Klingons above Pahvo in the Prime Universe. Over a century has passed since these events took place and Star Trek OnlineCaptains find themselves on the same forest planet where the Terran starship met its fate. A powerful ion storm transports a group of displaced time-travelers, survivors of the I.S.S Discovery and Ensign Tilly’s mirror-self, the vicious Captain Sylvia “Killy” Tilly of the Terran Empire. In a calculated attempt to take control, Killy threatens to destroy Pahvo, leaving it up to Starfleet’s finest to save the tranquil forest planet from total annihilation. More Star Trek: Discovery content is headed to Star Trek Online in the coming weeks. This includes added Task Force Operation rewards and “Pahvo Dissension,” a new featured TFO which returns players to Pahvo for another uprising against the Terran Empire. Details will be available on Star Trek Online’s official blog. The first episode of the highly anticipated second season of Star Trek: Discovery is now available on CBS All Access(https://www.cbs.com/shows/star-trek-discovery/). Star Trek Online is a free-to-play massively multiplayer online game that allows players to explore the Star Trek universe from within. Players can forge their own destiny as Captain of a Federation starship, champion the Empire through the far reaches of the galaxy as a Klingon Warrior, rebuild the Romulan legacy as the commander of a Romulan Republic Warbird or carry out daring missions on behalf of the Dominion as a Jem’Hadar soldier. Captains can also explore iconic locations from the Star Trek universe, make contact with new alien species and battle alongside other players in customizable starships. Star Trek Online is currently available on PC, PlayStation®4 and Xbox One. Star Trek Online is licensed by CBS Consumer Products.